Take a Kanto Tetsudo bus or Keihin Kyuko bus bound for Kashima Jingu. Get off at the Suigo-Itako Bus Terminal. Take a Kanto Tetsudo bus, JR bus, or Keisei bus bound for Kashima Jingu. Get off at the Suigo-Itako Bus Terminal. 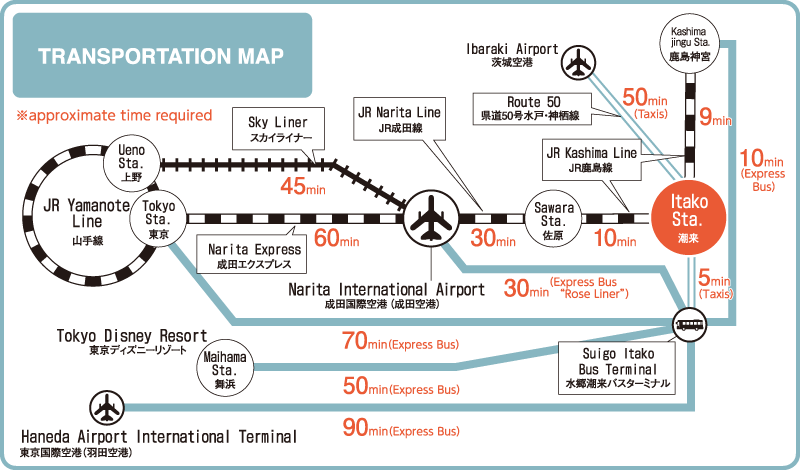 Take a Kanto Tetsudo bus or JR bus bound for Hasaki. Get off at the Suigo-Itako Bus Terminal. Take a Kanto Tetsudo bus bound for Hokota. Get off at Itako Station.